A good photography book can put you well ahead of the game, and these three essential nature photography books (plus maybe a few others) can save you years of time learning things the hard way. There are hundreds of photography books in my library, and I pick the best of the best to recommend to photographers. The following three books are essential reading to make a dramatic improvement in your nature photography (plus two more books on closeup photography). When I wanted to learn the ins and outs of nature photography, John Shaw’s book The Nature Photographer’s Complete Guide to Professional Field Techniques was far and away the best and most helpful book. Years later when I began teaching nature photography classes at the Kalamazoo Institute of Arts, I urged all of my students to buy Shaw’s book. John Shaw’s Nature Photography Field Guide is the second version of the book and the latest version is John Shaw’s Guide to Digital Nature Photography. It is still my favorite introduction to nature photography. You should read this book before you read anything else. It is as good as it gets. Art Wolfe is a world class photographer. If I could have my pick of any 5 photographers and spend one week with each of them creating images, Art Wolfe would be on the list. He is amazing. His book, The Art of the Photograph: Essential Habits for Stronger Compositions, should be the second book on your must read list. It is a first class introduction to photographic composition and design and covers all the basics for the beginning and intermediate photographer. Years ago I was taken by Galen Rowell’s breathtaking images in Outdoor Photographer and National Geographic. One of the best things I did for my own photography was to devour his book Mountain Light. The images are stunning. Better than most other photography books, the text in this one lets you get inside Galen’s head and think along with him as he creates his wonderful images. You can benefit from any of Galen’s books, but you should start with Mountain Light. Mountain Light and The Art of the Photograph: Essential Habits for Stronger Compositions are both “must read” books for any photographer, whether or not they are interested in nature photography. Closeup photography is a specialized sub-category of nature photography. I am including it here because it is so important to several kinds of nature photography including flowers, amphibians, small reptiles, spiders, insects, mushrooms, small shells, mollusks, small fossils, and a lot more. Closeup photography has some unique technical challenges. Some photographers love closeup photography and some don’t. If you think closeup photography is your thing, there are two excellent books I recommend. Start with my favorite, John Shaw’s Closeups in Nature. This is a must read book if you want to do closeup photography. Follow that with Close-up Photography in Nature by Tim Fitzharris. These two books will serve you well. 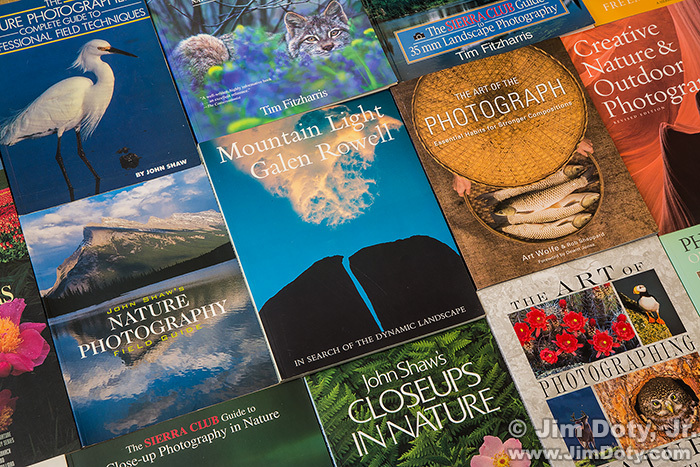 You can find all of these books in the Nature Photography Books section of my Amazon.com powered photography store. Some of these wonderful books are out of print but you can still buy used copies of these books by using the Amazon links in my photography store. There are a lot of other nature photography categories: landscapes, flowers, wildlife, birds, underwater photography, and more. You can find my “best of the best” book recommendations for each category by going to The Best of the Best: Recommendations For The Best Photo Equipment, Books, DVDs, Software, and Online Photo Labs and looking at the books section. My Two Favorite Introductions to Landscape Photography. If you only get two books on landscape photography, these are the books to get. Nature Photography Books section at my photography store. Store.JimDoty.com – My photography store has direct links to Amazon.com so you get the same great Amazon prices, service, and guarantee.